Roads are at the heart of the dispute on the White River National Forest. Gold miners around Breckenridge and silver miners around Aspen built the first roads, while livestock grazers improved Ute Indian trails for stock drives. Later yet came roads for power lines, water diversions and ski areas. Sightseers got other roads. After 14,005-foot Mount of the Holy Cross became a national monument in 1930, Franklin Roosevelt's Works Progress Administration crews built a road for the devout to glimpse the cruciform gullies of snow. By this time, road building had become a religion - a religion occasionally bucked by new ideas. In 1924, Arthur Carhart, then a Forest Service landscape designer, was dispatched to Trappers Lake, at the core of the original White River Reserve which had been withdrawn from the public domain in 1891. Carhart was supposed to configure a road and summer cottages around the lake. Instead, he concluded that any development would insult the magnificent setting. He persuaded his superiors; Trappers Lake is now called "The Cradle of Wilderness." In all, one-third of the White River Forest has been designated upper-case wilderness. The bulk of the forest's roads came in the great timber haul after World War II, when mechanization and market combined to create a labyrinth of well-built arteries and a host of feeder roads. The Forest Service justified building those roads in part because they later could be used for recreation. It's worked out that way. Big-game hunters used those roads to push farther into the forest, creating their own roads at a pace accelerated in recent years by all-terrain vehicles. The forest was and is being fragmented. Now, the agency is trying to close these proliferating roads. Bill Johnson knows both sides of the road-building divide. After growing up in Eagle, in the early 1970s, Johnson took up a chainsaw on behalf of the local Kaibab sawmill. That was toward the end of the great post-World War II timber harvest, when all roads led to logging. 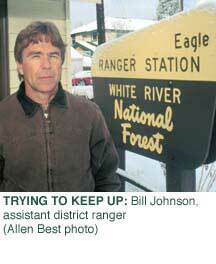 When Johnson saw the Extractive West leaving, he joined the Forest Service on the Eagle District. He's responsible for roads, and when he can get the funding, for taking them out. When it comes to maintaining the 350 miles of road on his district, he says, "We can't keep up with what we have." But Johnson believes there's plenty of access for recreationists of all persuasions - even after the population on his district triples to an estimated 30,000 people.